The local community is said to be “numbed” by the incident. TRIBUTES HAVE BEEN paid to a well-known east Clare builder and farmer who died in a workplace accident. 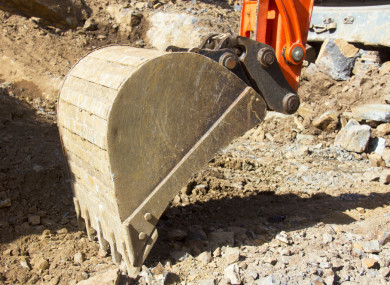 Pat O’Connor, a 71-year-old father of 10 children, died as a result of injuries he received while carrying out maintenance work on a mini digger near his home in the Magherabawn area of Feakle. Inspector David Finnerty of Killaloe Garda Station said gardaí are treating the fatality as a “tragic accident”. O’Connor’s death brings to 17 the number of people who have lost their lives in workplace accidents to date this year, with agriculture accounting for six of those fatalities. It is understood that O’Connor’s body was discovered by a relative in the early hours of this morning after he failed to return home after carrying out the repairs. O’Connor celebrated his 71st birthday in March and was well known in the building industry in Co Clare. His construction firm built the private Sean Dun housing estate in Ennis and also completed a number of local authority housing schemes. Local Fianna Fáil councillor Pat Hayes, who lives about two miles from O’Connor’s home, said the local community was “numbed” by the tragedy. The local community will do its best for the family. It is a real tragedy for the family. Pat had a number of teenage children and they are now without their dad. Another local man said he “was a very likeable character”. Finnerty said that O’Connor’s body was removed to University Hospital Limerick for a post-mortem. Two separate investigations by the Health and Safety Authority and the gardaí are underway into the incident. Email “Tributes paid to builder killed in 'tragic accident' in Clare ”. Feedback on “Tributes paid to builder killed in 'tragic accident' in Clare ”.